I joined the staff choir for two closely related reasons. First, I wanted a creative outlet. Second, I have always had a tolerable voice, and it frustrates me when I get so out of practice that I don’t sound right. So, staff choir was a great fit. What I did not realize, though in retrospect it should have been obvious, was that staff choir would force me to go to church a lot more often than I like. I have been to church more in the past three months than in the past three years. For many reasons, religion, in general, and Christianity, in particular, and I do not get along, so churches are hard for me. I feel awkward when I refuse communion, don’t bow my head for prayer, and don’t respond amen. But I feel more awkward doing these things, as it seems like I am lying to people in a church, and that I will not do. But I am no Atheist, although many confuse me for such. I believe there might be something out there, some design higher than I can comprehend. But I don’t know what to call it, I don’t know what it looks like, and I don’t know if if I agree with it. An atheist has faith that there is nothing there. And faith I have always had a problem with. I am no Agnostic either. The implication of Agnosticism is that a person does not know or care. I may not know, but I do care. Strongly. I keep asking, keep searching, but long ago resolved to not finding. Church always makes me think of such things. Always brings back the questions. So it was in this frame of mind that I found myself walking back from St. George’s Church, where I sang in the Christmas Chapel (The Christian schools in Mussoorie, the life-blood of these churches, shut down at the end of November, so Christmas chapels are held early before the students leave for break). I was on top of a mountain, past Chan Deggar and on our way to Sister’s Bazaar, the 2 shop building at the top of the mountain we live on. 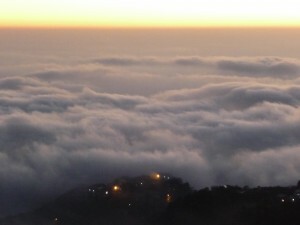 From here, there are usually two gorgeous views. 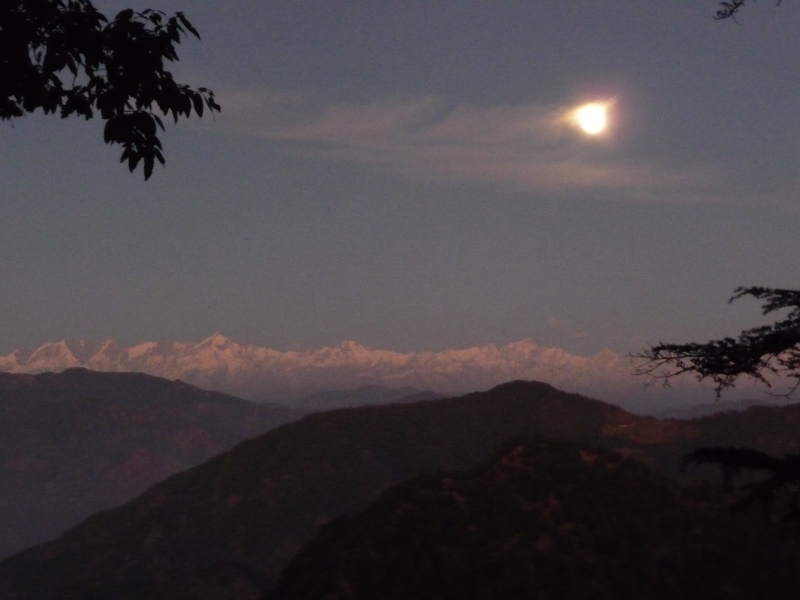 Facing north, you have the Himalayas, the real ones. Snow-capped, majestically rising from the earth, looking mysterious and enticing. Facing south, you can tell how high you already are, as the Doon Valley lays 6000 feet below us, the city of Dehradun spead out along the floor of the world. That is, usually that is the normal view. Tonight, there are clouds, very uncharacteristic in non-Monsoon season. 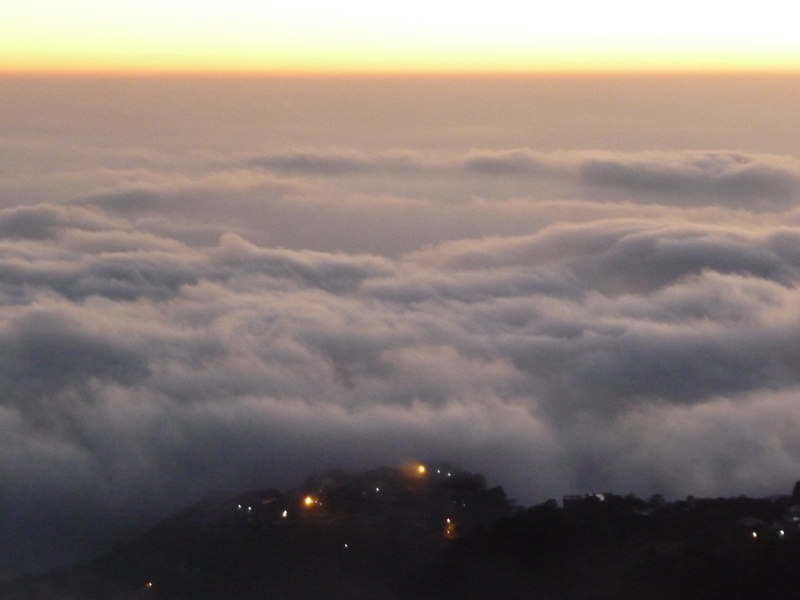 They cover the land 1000 feet below us, an ocean of mist flowing as far as the eye can see. 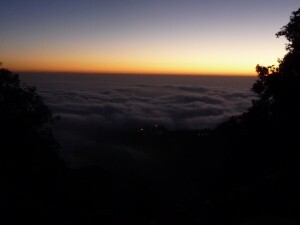 The town of Mussoorie is barely visible, and below that, nothing by the white of clouds and the orange of the setting sun. Stunning. And I wonder if this might be how a God sees us. Looking down on the earth, knowing there is a bustling world down there, but unable to see the truth of it through the clouds. I find this God comforting. A God who imagines us, not as we are, but as we might be. The view is obscured, so Whatever-It-Is is free to dream of us in a beautiful light. This makes sense to me. I want a God who does not interfere, who can not interfere, someone who just hopes we are figuring it out, by ourselves, somewhere below the clouds. I moved to India. I mean, why the hell not, right? Copyright Graelent. All Rights Reserved.